In our recent trip to National Gallery, it was clear that yet again Culturebaby was most attracted to the paintings of animals. This has become a real theme in recent months. It is fascinating to watch how toddlers are drawn to the familiar, and now at just two with Culturebaby walking, talking and expressing preferences, I love following her and seeing what catches her eye. In our last post (read it here) I wrote a little about some of the art appreciation resources that seem to work well for Culturebaby's age, including collecting postcards of works that she has loved and using these as flashcards, and having a painting of the week. I was really impressed to hear that the V and A, no doubt aware that parts of their collection might be a little tricky for young ones to explore, have produced a number of backpacks to aid children in their explorations. 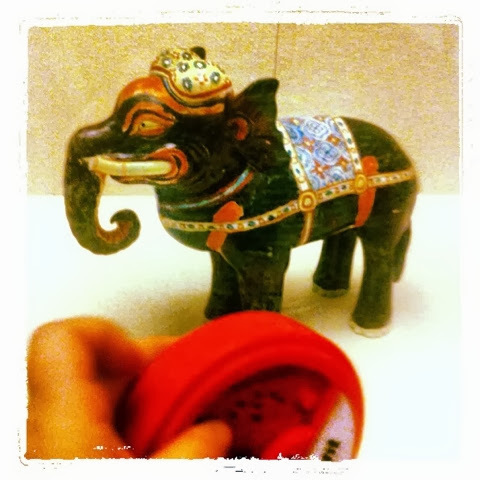 While Culturebump and I were snuggled up in bed having a rest, Culturebaby was transformed into Agent Animal, searching the Japan, China and South Asia Galleries to find 6 animals hiding there. The pack she was given contained audio buttons with animal noises and four fabric sensory jigsaw cubes. We were also impressed by a new series of toddler sessions, Tots Tales, aimed at 2-4 year olds at one of our local museums, St Albans Museum. Due to the aforemoaned builder induced exile, we've only made it to one session so far, but Culturebaby was so impressed with it, she has been talking about it ever since. 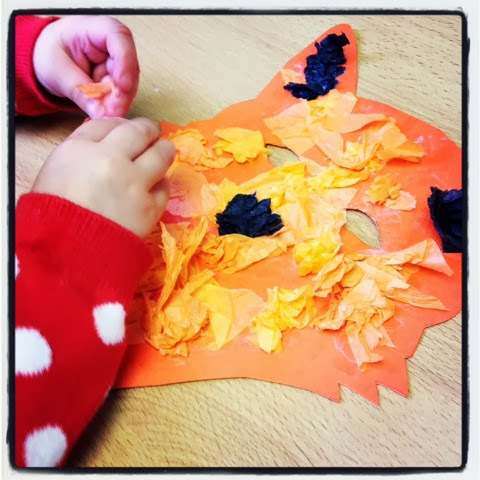 The session started with two cat themed stories and a simple craft session where the Tots made a cat from pre-prepared materials. 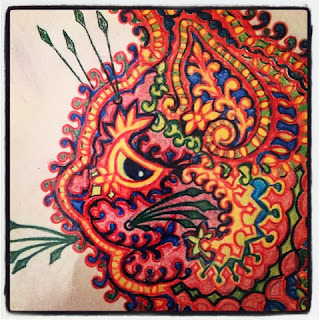 They were then sent on a trail to find a number of postcards depicting a print of Louis Wain's cat hiding around the museum - culminating with the work itself at the end. 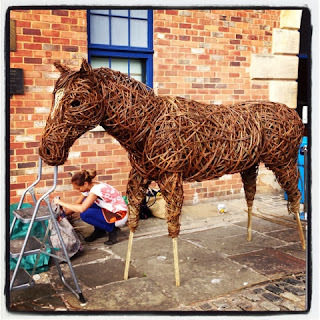 Culturebaby and her friend enjoyed this activity so much we had to do it at least twice. They loved helping each other to find the images and equally enjoyed retracing their steps to find them again and again. The power of postcards as prompts for memories really became clear with this exercise. Culturebaby was given a picture of the cat to take away with her and regularly points at it, mentions her friend and the fact they wanted to do the trail again... "more!" Finally, one of Culturebaby's favourite places is the fantastic collection of animals gathered by Lionel Rothchild at the Natural History Museum in Tring. 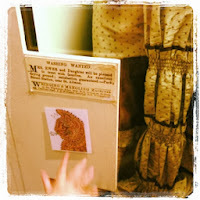 I shall rave about this museum properly another day, but it is worth noting that some of these Natural History museums also do brilliant creativity sessions for toddlers to bring the collections alive. 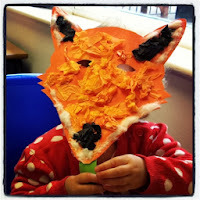 Culturebaby and her friend were recently involved in a workshop, tied in with the current exhibition theme of nocturnal animals, to create a fox mask. The session was short and well run, and the crafts were easy enough for a (nearly) two year old to handle. Some of the other upcoming activities are here. It really is worth keeping an eye out for these sorts of sessions. 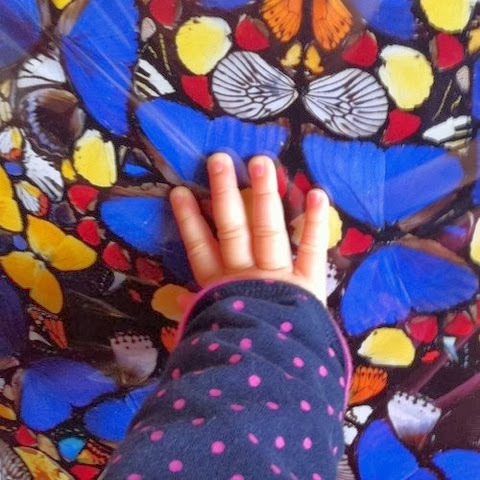 They have been not only brilliant in engaging Culturebaby with the collections, and providing her with the chance for creativity and her much loved activity of 'finding things', but they also encourage her, and me, to look at items on display in a new way. By focussing on a theme or limited number of items, I've found that we look more at these and notice things we might have passed by in a normal visit. There is also so much on this theme that you can do at home. There are some really excellent books, perfect for introducing babies and toddlers to art through the theme of animals. Here is our selection of six of the best we have discovered. We'd love to hear about any others you have found inspiring too. 1. Andy Warhol's Colours by Susan Goldman Rubin - this wonderful, colourful American board book, which we discovered online, introduces colours through Warhol's animal art. It is beautifully designed and made, is a perfect size for little fingers, feels shiny and beautiful to touch and has an engaging rhyme throughout. It was one of Culturebaby's first favourite books and came with us everywhere. The minute your baby is out of black and white books, I'd put this top of your to-buy list. 2. One Blue Hippo, An Ancient Egyptian Counting Book by the Metropolitan Museum of Art - Again this was a firm favourite with Culturebaby from a few months old. This inspired book was produced by someone who clearly had their finger on the pulse of the toddler Zeitgeist. One of the very best ways to introduce a toddler to Egyptian collections is through the familiar - animals - and this lovely little book contains photographs from the Met's collection from their iconic one Blue Hippo through cats, cows and horses, up to 10 busy scarab beetles. The fact that we knew this book well in advance of Culturebaby's trip to the British Museum made it so much easier and more exciting for her to point out similar items that had, through this book, become familiar. We picked up our copy from the British Museum shop. 3. 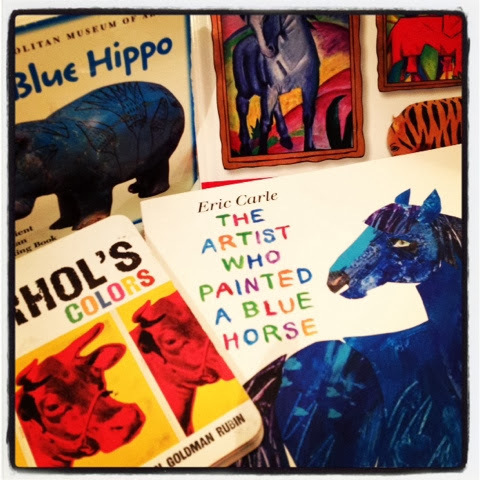 The Artist Who Painted a Blue Horse by Eric Carle - This beautifully illustrated book from the much loved author and illustrator Eric Carle takes Franz Marc's Blue Horse I (1911) as its inspiration. Culturebaby went through a phase of reading this over and over again. The book celebrates the freedom of art - that there is no wrong colour, that you don't have to stay within the lines - essentially that children should be able to produce whatever their imagination allows. I love the idea and I love the book. I also discovered a little video of the artist talking about the inspiration for producing it (you can watch this here). He too talks about the importance of introducing both painting and creativity but also museums and art books to young children. As I was writing this post, I had the book out again yesterday and Culturebaby read it four times in a row. This time I noticed that she practically knew it by heart. 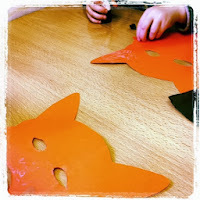 Is is not only simple but it provides an excellent way of learning animal names and colours. 4. 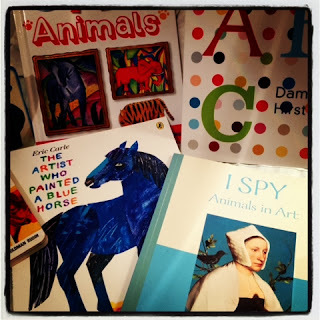 I Spy Animals in Art by Lucy Micklethwait - This is part of a great series of books which take high quality famous paintings and encourage children to spot items along a theme. Containing works from a range of periods and styles, from landscape to portraiture and both Western and some Eastern art, this series could have many lives in a household and is worth investing in. Culturebaby enjoys spotting and naming items in pictures at present and this book is perfect for that, but the high quality images and useful selection of paintings along a theme could be used for project work for older children and even for the aforementioned painting of the week. 5. ABC Damien Hirst - This gorgeous book has just been published and is a work of art in itself. I particularly wanted to get it for Culturebaby because she loved Hirst's exhibition last year at the Tate Modern (see our post about it here). As I wrote at the time, some people see Hirst's work as rather macabre and might question the appropriateness of a children's ABC book containing images of many his iconic works, but I disagree. With some exceptions I find his work uplifting and hopeful, and for Culturebaby it offered a wonderland of bright moving images, live butterflies, bold colours, reflective surfaces and sparkling jewels. For Culturebaby the flies in A Thousand Years 1990 (a life cycle from cow's head, to flies, to fly killer) were merely dynamic and engaging; and the fish, lambs, cows and shark preserved in formaldehyde are (rather serene) characters recognisable from her books rather than images of death. The book isn't all animal themed, but there are a number of striking examples within it.